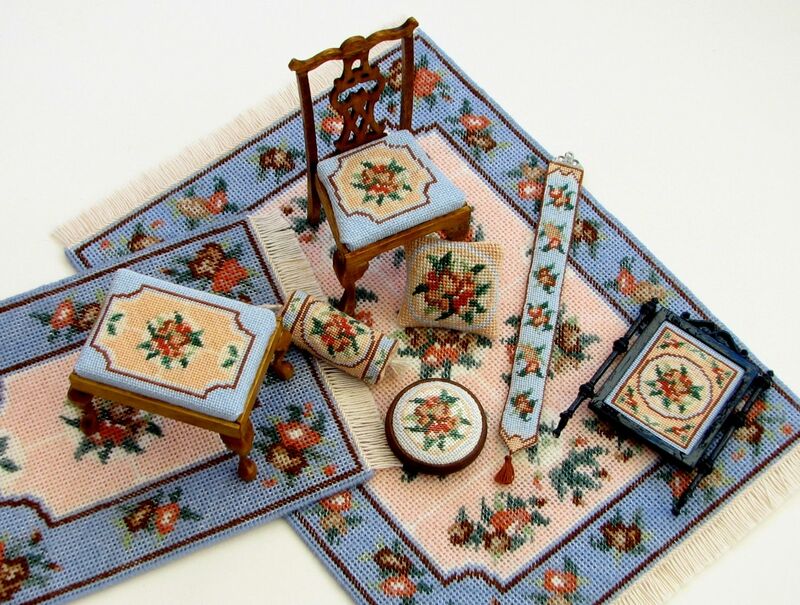 This is my latest range of doll’s house needlepoint kits for one twelfth scale doll’s houses – the design is called ‘Alice’, after a friend of mine who lives in Edinburgh. The design is available in all these different types of kit – two sizes of carpet, cushion, round footstool, rectangular stool, dining chair, firescreen, bellpull and bolster cushion. To give you an idea of the scale, the large carpet measures eight inches by six and a quarter inches. The bellpull is four and a half inches long. The carpets are to be stitched on 18 count interlock canvas with Appleton’s crewel wool (chart packs are also available, if you’d prefer to make them in a different colourway or a different count of fabric). The cushion is to be stitched on 22 count canvas with two strands of Anchor stranded cotton. 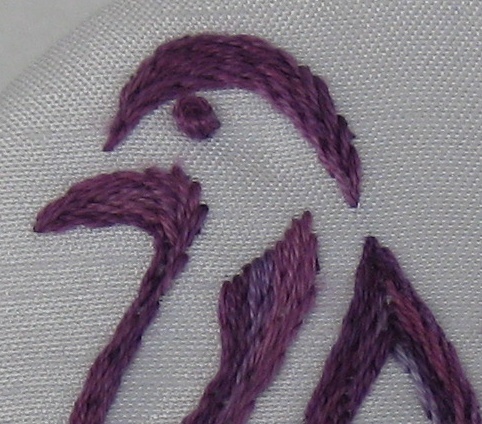 All the other kits are to be stitched on 32 count silk gauze, with one strand of Anchor. Prices start at 4.50 GBP for the cushion. Postage is free worldwide on any order of 10 GBP and over. They have all just been added to the website today, and are now available from the online shop: http://www.janetgranger.co.uk/acatalog/index.html . How low have we sunk?! During the past few days, with the UK media totally taken up with the looting and arson that has been going on in our major cities, several theories have been discussed as to how to deal with the %&*^# who have done these crimes. One member of the public who expressed a view on a forum said that the young people (and it *is* mainly young people) should be locked up, and the boys made to do heavy manual labour, AND THE GIRLS MADE TO DO SEWING!! Oh dear, sewing has now become a PUNISHMENT? Says it all, really. Who was it who said that when a society doesn’t respect art, it is doomed? 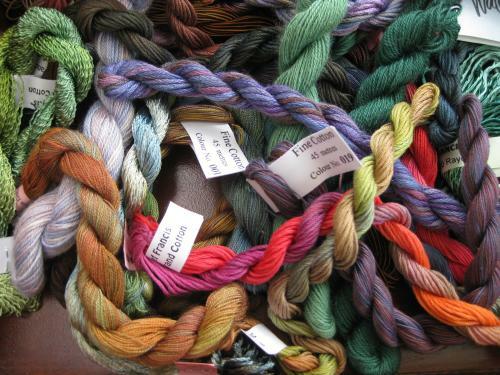 Author Janet GrangerPosted on August 11, 2011 February 5, 2014 Categories Black silk handbag, StumpworkTags Crafts, Criminology, Embroidery, Finished embroidery, Hand embroidery, Handbag, Sewing, Stumpwork, UK riots15 Comments on How low have we sunk?! 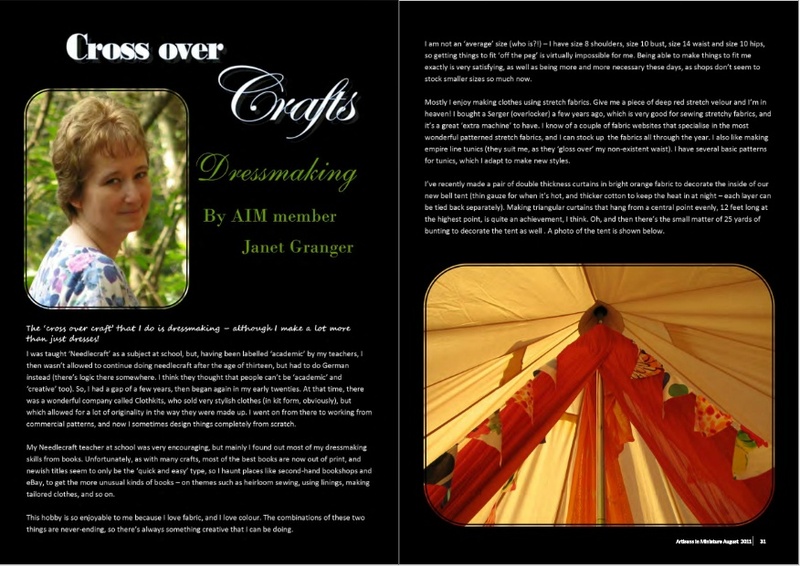 In this month’s free Artisans in Miniature online magazine, I have an article on my love of dressmaking. It’s a hobby I’ve had since I was a teenager – but what I’ve actually made over the years has changed, from clothes for myself to more unusual things such as curtains for a bell tent! It is very different from what I do for a living now – designing embroidery kits for adult scale doll’s houses (1:12 scale). 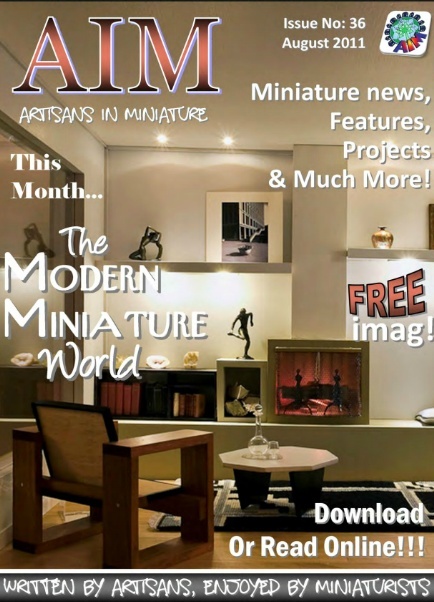 This month’s magazine has the theme of ‘modern living’ for many of the articles – as well as having the usual sprinkling of how-to’s, there is a gallery of wonderful photos to show you what the top miniature artisans are doing at the moment.